Pinkishe Foundation: An initiative run by women to provide sanitary napkins among underprivileged women. The initiative work as collecting sanitary napkins through donations and redistributing them among the women who can not afford those. The organisation is also working on creating a new helpline exclusively for women that will deal with various women related issues. Breaking all the stereotypes, a group of women in Uttar Pradesh’s Ghaziabad have come up with their initiative to provide sanitary napkins among underprivileged women. Pinkishe Foundation is an organisation run by women who work 24X7 for their initiative called Pad Bank. The initiative work as collecting sanitary napkins through donations and redistributing them among the women who can not afford those. 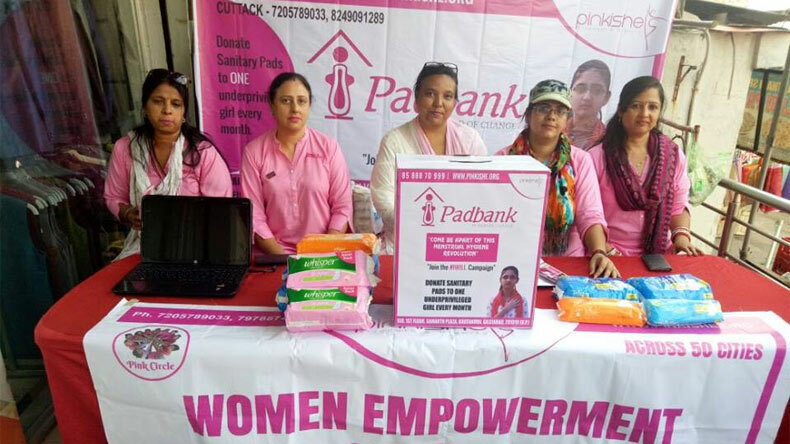 “Pad Bank is just the beginning, we have so many initiatives to take and so many miles to go,” said Arun Gupta, President of Pinkishe Foundation and the only man in the all-women organisation. When asked about the reason behind to start the Pinkishe Foundation, he told that it was her daughter’s idea. One day his domestic help came to the home with her daughter. His daughter who was in Class 11 then, noticed the blood stains on help’s daughter’s clothes. When asked, she told that she didn’t have any sanitary pad or cloth to use. Then his daughter came to him and suggested him that we should help the maid’s daughter. She also suggested him that we should open a pad bank on the lines of the blood bank. And that is how the initiative took a shape. In just nine months, the organisation has gathered over 1.5 lakh volunteers and members from across the country who believe in change. The organisation has set up its offices in Srinagar, Calcutta, Asansol, Hyderabad, Bhopal, Patna and Ahmedabad etc. The Pinkishe Foundation has a long way to go. For now, the foundation is creating and raising awareness regarding the menstrual hygiene. Both men and women can actively work with the organisation for empowering women and raising awareness on various women issues. The foundation is also working to launch a helpline exclusively for women that will deal with various women issues like domestic violence, dowry issues, household issues, sexual abuse, sexual assault and so on.